Tax Justice Network: The Missouri-Kansas border war and the disaster of tax "competition"
The Missouri-Kansas border war and the disaster of tax "competition"
We have for many years explained how engaging in tax "competition" is a disastrous economic strategy for any jurisdiction, and an even greater collective disaster for the world. Tax "competition" bears no economic relation to healthy market competition; on the contrary, it distorts markets; increases complexity, steepens inequality and deepens poverty, and erodes countries' sovereign powers to create the tax systems that voters want. Tax competition is economic warfare and has no redeeming features of any kind. Any politician or economist who favours it has fallen prey to economic fallacies - or is a shill for vested interests. See their arguments derobed here. One of the hotspots of the tax wars inside the United States is State Line Road, the dividing line between Kansas and Missouri. These states have been aggressively using their state tax codes to try and poach businesses from each other, to the collective detriment of both. "Kansas Gov. Sam Brownback had embarked on an aggressive tax-cutting policy which sweetened the pot by offering incentives to businesses willing to relocate. Missouri passed a similar tax measure, which Gov. Jay Nixon recently vetoed." "Critics and some economists say tax incentives prevent revenue from going into schools and local roads which ends up hurting both states in the long term. 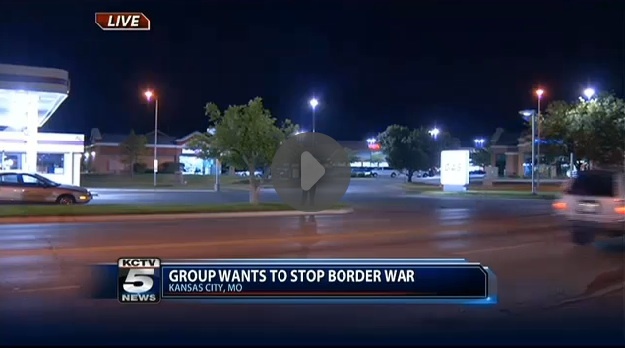 That was the focus of a recent University of Missouri-Kansas City forum. "In terms of the message to economic students, lowering taxes: it is which taxes and at what expense. It is questionable in terms of where our revenue is going to come from," said Annie McKay with the Kansas Center for Economic Growth. Quite so. A recent study that we cited in April found that Kansas and Missouri alone had spent at least $192 million in tax subsidies to poach jobs from one another despite an 'anti-poaching' agreement; the net result appears to have been only a tiny net jobs migration of a few hundred jobs (in favour of Kansas) but at very, very high overall cost to both states. The latest efforts are nothing new. "We shouldn't have some sort of race to the bottom to create jobs that don't create any kind of quality of life," said state Sen. Paul LeVota in Missouri's 11th District. If that sounds like sour grapes from a Missouri politician, consider that his colleague across the state line agrees. "Our local business leaders from both sides of the state line needs to step up and say, 'it is time to stop and re-evaluate,' because at the end of the day, we're not doing any favors for anybody here," said state Sen. Tom Holland in Kansas' 3rd District. These politicians have avoided the economic fallacies and have clearly understood what is happening here. This is economic warfare, from which the only winners are the wealthy owners of the corporations that gain the tax benefits: for it is on the owners of capital, not the ordinary workers, upon which the tax charge falls. So tax "competition" creates, as tax writer David Cay Johnston once put it, "not trickle-down, but Niagara up." For more on this general subject, see our briefing on tax competition here, with further stories here. Note to journalists: when writing about this subject, it helps to put the word 'competition' inside quote marks, as a marker to show understanding of the economic issues involved.